Mumbai: Personal and home care products maker Hindustan Unilever Ltd’s (HUL) troubles with an eroding market share haven’t disappeared, but are less severe now than a few months ago. Data from research firm Nielsen Co. for October show HUL has arrested the decline in value market share in three categories—soaps, washing powder and skin cream. This gives the management something to cheer about. After all, the management had said in October that it saw a turnaround in market share and expected further improvement starting October. But HUL still has miles to go before it can breathe easy. The latest data show only four of its 10 categories have managed to hold on to their market share. 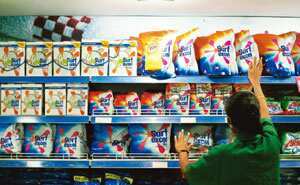 The other six categories—shampoos, packaged tea, toothpaste, detergent cakes, talcum powder and utensil cleaners—continue to take a beating at the hands of competition, even if the margins are not a painful topic now. The data also show that volumes continue to be a concern for HUL, even in the categories where it has escaped market share erosion. In this criteria, eight of the company’s top 10 categories have seen a decline. Volumes in the soap segment declined 9.5% in October on a year-on-year basis, despite a 17 basis point gain in market share. The packaged tea segment, on its part, has seen volumes declining 16.4% year-on-year. However, HUL hopes the turnaround has started and will gather steam in the coming quarters. It is banking on streamlined distribution cycle, increased advertising budget and increased focus on regional brands for the thrust.